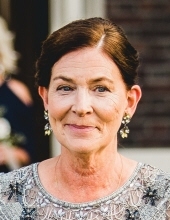 Billerica – Anne T. Moore – Age 60, beloved wife of Fredric A. Moore died peacefully Tuesday, surrounded by her family at Massachusetts General Hospital after a courageous battle with cancer. She was born in Winchester, March 26, 1958 and raised in Woburn. She was the daughter of Irish immigrants, Theresa (Barry) Flaherty of Woburn, and the late Peter Flaherty. She was a longtime North Billerica resident. Mrs. Moore was employed as nurse at the Tewksbury State Hospital for over 20 years. Prior to her graduation from the former Tewksbury Hospital School of Practical Nursing she worked for many years at the Purity Supreme in Woburn. A dedicated wife and mother, she most cherished spending time with family. In her free time she enjoyed gardening in her backyard and traveling, especially to Ireland. Besides her husband and mother, Mrs. Moore is survived by her sons, Kevin Moore and his fiancé, Danielle Lattari of Boston, Michael Moore and his wife Sierra Calla of Lowell, and Matthew Moore and his wife Meaghan of Hudson, MA; her brother, Peter Flaherty of Shrewsbury; her sisters, Julia Whitney and her husband Mark of W. Medford, Maryellen Solazzi and her husband Robert of Woburn and Margaret Conneely and her husband Tomas of Galway, Ireland and many nieces and nephews. MOORE – Of Billerica, Jan. 22, Anne T. (Flaherty) Moore, A Memorial Visitation will be held Sunday at the SWEENEY MEMORIAL FUNERAL HOME, 66 Concord Rd., Billerica from 1-4 p.m. Her burial will take place at a later date. Memorial contributions may be made to the Doug Flutie Jr. Foundation For Autism, P.O. Box 2157, Framingham, MA 01703. "Email Address" would like to share the life celebration of Anne T. Moore. Click on the "link" to go to share a favorite memory or leave a condolence message for the family.